MSC Cruises is making it easy and affordable for families of four to cruise for the holidays. 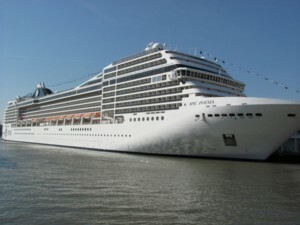 The line is offering a Family Plan for 7-night holiday sailings to the Caribbean onboard MSC Poesia through December 31, 2010. Guests who book a balcony stateroom during the Thanksgiving, Christmas, or New Year’s Eve Caribbean cruises can save up to 50 percent off a connecting balcony stateroom for an affordable family vacation. This special Family Plan offer applies for adjoining Category 9, 10 or 11 Balcony Superior staterooms (accommodating up to four guests) on 7-night, Eastern and Western Caribbean cruises departing from Ft. Lauderdale. These cruises sail November 21 (Thanksgiving), December 19 (Christmas), and December 26 (New Year’s). Family Plan rates for four begin at $697 per person plus $81.35 per person government fees and taxes (GFTs). Destinations on the Eastern and Western Caribbean cruises including ports like Key West, Florida; Ocho Rios, Jamaica; Georgetown, Grand Cayman; Cozumel, Mexico; St. Thomas, Charlotte Amalie, U.S. Virgin Islands; Philipsburg, St. Maarten; and Nassau, Bahamas. Family-friendly activities to enjoy during this affordable family vacation include miniature golf, tennis and basketball. MSC Poesia features a pool for children and outdoor play area. MSC Cruises also offers a complimentary kids program filled with entertainment, fun, and games from crafts to treasure hunts. Children’s programs are available for children 3-17 years old and are divided into age-specific groups. Not only does MSC Cruises offer authentic Italian favorites like pasta and pizza, but also All-American kid-friendly staples like hamburgers, hot dogs, and delicious pastries and desserts. Rates are cruise only, and subject to availability. MSC Cruises also has a policy of kids 11 and under sailing free when sharing adults” cabin. MSC Cruises is one of the fastest-growing cruise lines in the world with a fleet of 11 ships: MSC Magnifica, MSC Splendida, MSC Fantasia, MSC Poesia, MSC Orchestra, MSC Musica, MSC Sinfonia, MSC Armonia, MSC Opera, MSC Lirica and MSC Melody. The fleet cruises year round in the Mediterranean and seasonally in Northern Europe, the Atlantic Ocean, the Caribbean, US and Canada (Fall 2010), South America, the Indian Ocean, and South and West Africa. For more information, call 877-665-4655, visit www.MSCCruisesUSA.com, or contact a local travel professional. This entry was posted on September 1, 2010 at 3:44 pm and is filed under Caribbean cruising, cruise deal, cruises, family travel, travel deals. You can follow any responses to this entry through the RSS 2.0 feed. You can leave a response, or trackback from your own site.